Tulsa Roots Music and Gilcrease are proud to present Music on Exhibit, a series of Sunday concerts featuring internationally recognized artists at the museum’s Tom Gilcrease, Jr. Auditorium. The concerts are free with museum admission. 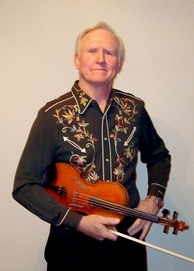 We kick off the series with Byron Berline, perhaps the most accomplished bluegrass and Western swing fiddle player in the world. Born in Kansas, he picked up the fiddle at age five. As a young man in the ‘60s he recorded with the Dillards and met Bill Monroe, the grand patriarch of bluegrass, at the Newport Folk Festival. Monroe offered him a job with his Bluegrass Boys, but Berline turned it down to finish his teaching degree at the University of Oklahoma. A few years later he took Monroe up on his offer and joined the Bluegrass Boys, recording three instrumentals, including his “Gold Rush,” co-written with Monroe, a jam session standard. The army draft ended his time with Monroe. Upon discharge, he joined Dillard and Clark, relocated to Southern California, and managed to win the prestigious National Old-time Fiddle Contest Championship three times. In 1971 he joined The Flying Burrito Brothers, followed by work with Stephen Stills and others. Berline joined forces with guitarist Dan Crary, banjo player John Hickman a and others to form Byron Berline and Sundance, releasing their self-titled debut in 1976. A young Vince Gill later joined the band on mandolin. Later Berline formed the band California, which was named the International Bluegrass Music Association Instrumental Group of the Year for several years in the ‘90s. In 1995, Berline moved to Guthrie, Oklahoma, opened the Double Stop fiddle shop, and presided over jam sessions at the store, from which the Byron Berline Band took root. Two years later he founded the Oklahoma International Bluegrass Festival, which has lured some of America’s greatest roots artist to Guthrie, including Earl Scruggs, Ricky Skaggs, and John Hartford. Berline recorded several solo albums, most notably the Grammy nominated Fiddle and a Song, which featured guest performances from Scruggs, Monroe, and Gill. The Byron Berline Band band tours the U.S. and Europe regularly, and Berline has recorded with a who’s who of music royalty: the Rolling Stones, Bob Dylan, Elton John, The Byrds, Earl Scruggs, Willie Nelson, Doc Watson, Rod Stewart, The Eagles, The Band, Gram Parsons, Emmylou Harris, Tammy Wynette, The Doobie Brothers, Lucinda Williams and many others. His music has appeared in many television and film soundtracks, including Star Trek, Basic Instinct, Blaze, Northern Exposure and Run Simon Run.